This guitar is built superbly with an unusual wood combination that further separates it from the host of alder or ash-bodied, maple-necked options out there. Boutique-style build; the pickups; hardware; rock-edged voice. No gigbag supplied; ‘Marmite’ body outline; slightly more generic HSS voicing. Irrespective of this brand’s history, it’s the new guitars that interest us. Yes, the name is old Shergold, but the new guitars retain little of the original’s style. 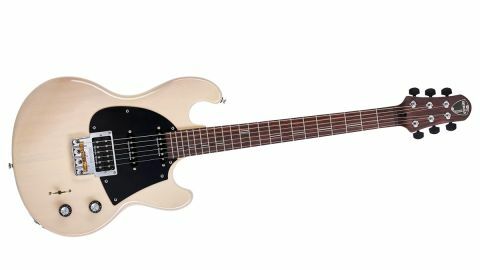 There are three new guitars coming from the brand - the Masquerader 1, 2 and 3 - that share the same chassis; the differences lie in the pickup complement, bridge and wiring. While the new design follows a pretty standard bolt-on recipe, its ingredients are more unusual. Instead of going for the Fender blend, we have a 45mm-thick mahogany body with a big edge radius and well-shaped forearm and rib-cage contours. The more usual maple neck is swapped for rosewood - usually reserved for more upmarket guitars - that is fixed with four screws, inset into their own washers, while the heel area itself is reduced in depth, removing some heel bulk. Now, if the body has quite a rudimentary, utility feel, then the neck really is anything but. It’s one piece of rosewood, with an additional slice of rosewood fingerboard, and all of our samples have noticeably different grain in different shades of dark/milk chocolate colour. All of them, however, have a super-smooth satin feel. The fingerboard itself goes for a Gibson-like camber, the fretting is super smart and smoothly polished, and the edges are actually rosewood bound so you can’t see the fret tangs. It’s a very classy job. Likewise, the aluminium line position markers, although in playing position they do disappear a little. Also, oddly, while the 22nd fret sits over the end of the neck, there’s a fingerboard overhang that means if you want to remove the scratchplate, you have to remove the neck - a small detail that Patrick tells us will change. The headstock recalls the original Shergold and scoops down from the fingerboard face like a six-in-a-line Fender, but this one’s three-a-side, with locking tuners, black ebony-like buttons, staggered height posts and large knurled-edge rear locks. Truss rod adjustment is behind the nut and the only logo is the inset Shergold badge. The back of the head has a handwritten seven-digit serial number and there’s no country of origin indication anywhere or model name. It all creates a very hand-built, boutique-y vibe. The Masquerader 2 has a Tele-style ‘ash tray’ bridge plate, with three compensated brass saddles and through-body stringing, but the side walls of the tray stop just past the front of the saddles where the plate flares out to accommodate the full-size bridge humbucker. All the guitars in this range are voiced with USA-made Seymour Duncan pickups. The Masquerader 2 goes for the same bridge pickup as the 1, but it’s mated with a Duncan SSL-6 at the neck and a SSL-6 RW in the middle position. The thick Bakelite scratchplate is a nice touch, with its muted antique appearance. The same material is used for the rear cavity coverplate, which, when removed, reveals a spacious cavity with tidy wiring and 500k pots on the humbucker models and 250k pots on the SSS guitar. A treble bleed capacitor/resistor circuit features on the master volume controls of all three models. Overall, there’s an undeniably high level of quality in both the specification and construction detail here. The only potential ‘Marmite’ feature - and it’s an important one - is the actual body outline with its stubby, in-curved upper horn that might recall and certainly improve on the original, but will no doubt have the forums buzzing. And while we reflect on the appearance, the four colours are all a bit, well, dowdy. All three of these new models are very well-sorted guitars, nicely weighted with slinky playability and a comfortable, workmanlike strapped-on feel. Barring a few pickup height adjustments, we’d happily head off to a gig with any of ’em. The neck shape is a full and very well shaped C (21mm deep at the 1st fret; 23.5mm at the 12th), the shoulders are nicely tapered, and there’s a subtle roll to the fingerboard edge. Its ‘everyman’ shape disappears in the hand, feeling equally comfortable with thumb-around or behind left-hand positions. Subtle considerations, such as control and switch placement, fall intuitively under your hand, and pot tapers are smooth. Everything works and you get a reassuring sense of quality. so the sparkly, brighter, vintage PAF. The 2 kicks a little harder than the 1, adding a cocked wah voice into our cranked Marshall on its bridge JB. The neck single coil fulfils its overwound design with a nicely matched power-Strat tone, with plenty of midrange character. The brighter middle pickup restores welcome highs, but is happiest in crunchy and gained environments with plenty of pedalboard action.